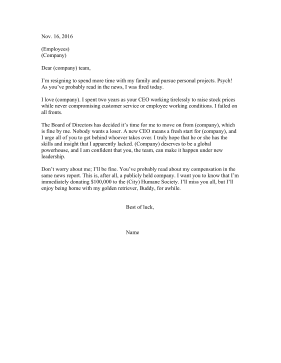 This tongue-in-cheek resignation letter is for a CEO who has been fired and is feeling snarky about it. I'm resigning to spend more time with my family and pursue personal projects. Psych! As you've probably read in the news, I was fired today. I love (company). I spent two years as your CEO working tirelessly to raise stock prices while never compromising customer service or employee working conditions. I failed on all fronts. The Board of Directors has decided it's time for me to move on from (company), which is fine by me. Nobody wants a loser. A new CEO means a fresh start for (company), and I urge all of you to get behind whoever takes over. I truly hope that he or she has the skills and insight that I apparently lacked. (Company) deserves to be a global powerhouse, and I am confident that you, the team, can make it happen under new leadership. Don't worry about me; I'll be fine. You've probably read about my compensation in the same news report. This is, after all, a publicly held company. I want you to know that I'm immediately donating $100,000 to the (City) Humane Society. I'll miss you all, but I'll enjoy being home with my golden retriever, Buddy, for awhile.